Danube Revisited - The Inge Morath Truck project. Danube Revisited – The Inge Morath Truck Project, is a photographic road trip along the Danube and a travelling exhibition of the work of renowned Magnum photographer Inge Morath, inside a converted 7.5T truck. The exhibition of her work from the Danube will make its way back along the river, accompanied by eight female photographers who will produce new work along the way and promote the power and potential of photography through night projections, artist talks, photo forums and engaging in cultural exchange with institutions and organizations along the route. The participating photographers are all recipients of the grant given annually in Morath's name, by the members of Magnum Photo Agency. Approaching their shared subject as a collective, they hope to discover for themselves the region that meant so much to Inge Morath throughout her life, the River itself becoming a metaphor for the kind of long-term, sustained international projects to which they have devoted their careers. A core motivation for each of these women is to support the under-represented female voice in documentary photography. As such they have created a project that is for women, by women, and in the legacy of a pioneering woman. In line with this vision, Danube Revisited is offering female photographers in the Danube region special exhibition and publishing opportunities as a part of the project. As the final result of the Project, Fundación Telefónica will produce a book and exhibition that will include Inge’s work in the región together with the new photographs created on the Danube Revisited tour, and the most interesting photography projects made by local women photographers. Danube Revisited. The Inge Morath Truck Project is a creative collaboration between Fotohof Gallery, Salzburg, which facilitated Inge Morath’s journey along the Danube, The Inge Morath Foundation, New York and the 8 Award winning photographers. The project would not be possible without the support of our primary sponsor Fundación Telefónica, and the support we have recieved from the Magnum Foundation, Spedition Ebeling Truck Company, Tiny Letter, Air BnB, Mercedes Benz, The department of Culture and Arts, Western Australia, Conaculta and our generous Kickstarter backers. •	Tour the historic photographs from Inge Morath’s voyage along the Danube as a mobile exhibition in a converted truck, allowing her work to be seen in large cities and small villages alike. The “gallery-truck” concept allows the work to be returned to the very villages where her photographs were taken, during and after the Soviet occupation, engaging communities with their own history. •	Continue this photographic legacy by creating new work along the length of the river. The new work will be created by 8 talented women who have been selected by the membership of Magnum Photos Agency and the Inge Morath Foundation as photographing in the spirit of Inge Morath. The Danube will be documented through eight unique perspectives and styles, united by the sharp cultural analysis for which these diverse photographers are renowned. •	Promote the power and potential of documentary photography through free night projections, artist talks, open forums and cultural exchange, engaging the general public in both rural and urban settings along the Danube. This will be supported by a network of large and small organizations and institutions that have partnered with the project along the route. •	Support the under-represented female voice in documentary photography by focusing on a project that is for women, by women, and in the legacy of a pioneering woman. Our partner institutions will help us identify emerging and established women photographers in their local area who we will engage with in two ways. First, in each town we will offer a round table portfolio review and discussion for female photographers. Second, we are inviting 4 women who have created exceptional work in the region to join us on the tour for 5 days, participating in and contributing to the project, exhibitions and book publication. The Inge Morath Truck Project is scheduled to tour for 5 weeks, in summer 2014. Starting at Donaueschingen, the source of the river in Germany, the truck will work its way along the river to the final destination, the Black Sea. The 8 photographers will travel together, coming and going as their schedule permits. 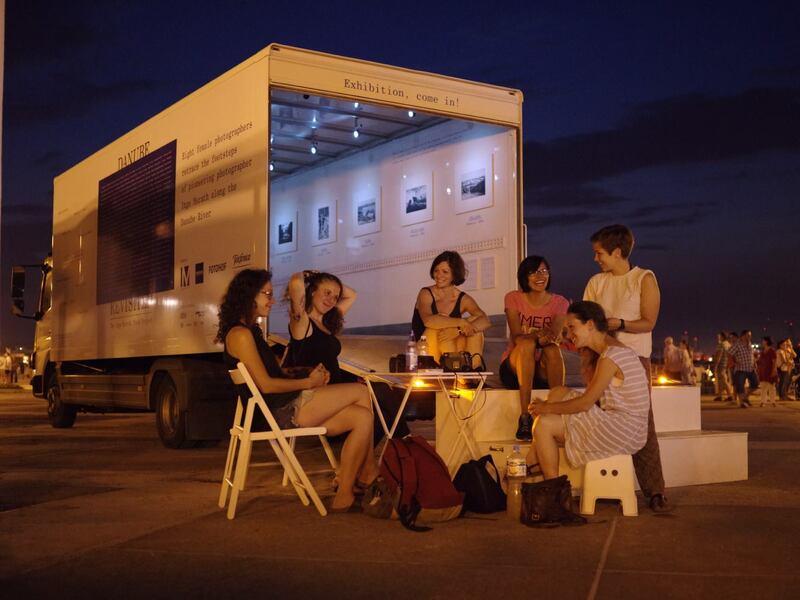 Every other day the truck will stop at a new destination, where a partner institution or organization will host the project, opening the truck gallery to the general public, and exhibiting open air night projections as well as engaging the public in a variety of photo forums. The participating photographers will photograph their own personal projects relating to the river and the region around these scheduled events. During the tour 4 local women will participate in all the project activities for 5 days each, offering an invaluable cultural and photographic exchange for both the Inge Morath award winners, and the local photographer. The Danube has always been one of the great symbols of Europe, connecting and dividing countries and cultures. Much has changed in the region since Inge Morath documented life along the Danube before and after the fall of the Iron Curtain. Danube Revisited - The Inge Morath Truck Project, provides a unique opportunity to amass a new collection of visual stories that examine contemporary culture along the river. We will each have a subjective approach with our photography, and together with our selection of local women’s photography this will offer a unique and very rich representation of Europe’s most mythical river.